Gene editing creates virus-resistant pigs… but what about a unicorn? What defense CEOs said behind closed doors… reader queries Jimmy Carter’s “special treatment”… the next big accounting hoax… and more! The title we’ve given this chart — and today’s episode of The 5 — is admittedly ghoulish. But is there any doubt about its accuracy? The slaughter took place a week ago today. The buying began in earnest a day later, in anticipation of a renewed push for gun control from the White House. The buying accelerated after the president’s speech Sunday night, fulfilling those expectations. The buying continues this morning — Smith & Wesson (SWHC) is up another 2.3% as we write, while the S&P 500 is up barely a half percent. 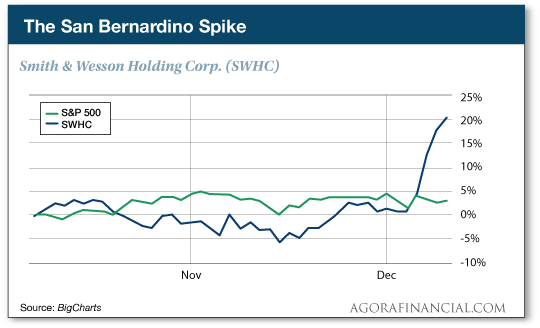 Yesterday, SWHC announced its third-quarter profits had tripled from a year earlier — trouncing the proverbial “analyst expectations.” The company raised its guidance for 2016 on both earnings and revenue. “I suspect that 2016 will be a great year for gun-makers,” our Byron King said in this space three weeks ago. What we didn’t share at the time — out of respect to his paying Military-Tech Alert subscribers — is that his best-of-breed recommendation was SWHC. It’s still a buy in his estimation — not least because he figures SWHC has the inside track for an Army contract to replace the M9 9mm pistol that’s been issued to every soldier over the last 30 years. 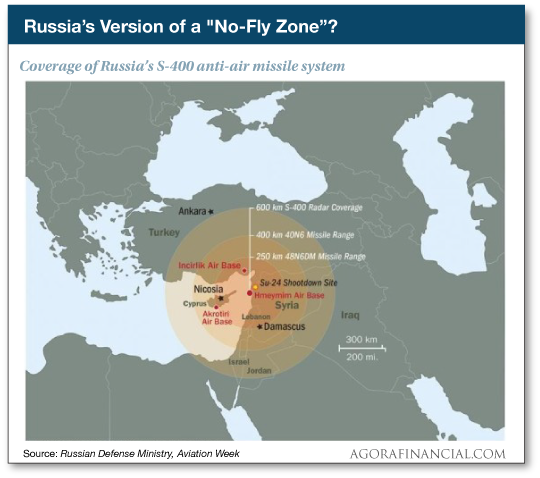 Now a follow-up on Jim Rickards’ warning a week ago today about the growing potential for a new world war: It turns out Russian leaders believe Turkey’s shoot-down of a Russian jet last month on the Turkey-Syria border was grounds to declare war. But Turkey belongs to the U.S.-led NATO alliance, and that would have meant full-on war between NATO and Russia. The Russians settled on economic sanctions. And they might not be done with those; they could easily shut off the pipelines sending oil from Russia to Turkey, although Medvedev had nothing to say on that topic. Back in August, Russian President Vladimir Putin summoned the Turkish ambassador to the Kremlin and dressed him down for Turkey’s tacit support of ISIS in Syria. “Tell your dictator president he can go to hell, along with his ISIS terrorists!” said Putin, according to The Moscow Times. “I shall make Syria into nothing but a big Stalingrad” for Turkey. So there’s some context for the shoot-down last month. “Still, why would Turk bait the bear?” Byron asks rhetorically. “Why shoot down Russ aircraft? 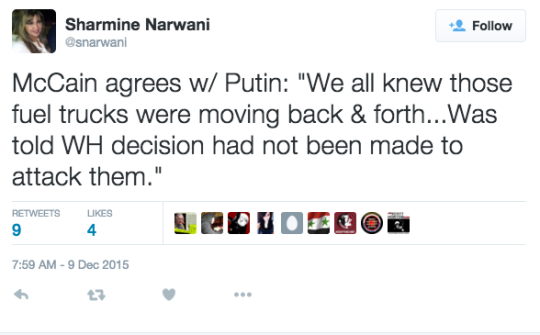 That might be the first and last time Putin and Sen. McCain agree on anything. Now comes the escalation. “About a month ago,” Byron wrote in a Military-Tech Alert briefing last Friday, “the U.S. side moved F-15C aircraft to the massive air base at Incirlik, Turkey. “These are not ‘bombers’ with which to attack ISIS targets. No, F-15Cs are absolutely air defense/air battle-type aircraft, and solely there to aim their pointy noses at Russ forces. Russ, in turn, is now arming its aircraft with air-to-air missiles. “Speaking of missiles, Russia was already in the process of moving its well-regarded S-400 anti-air missile system into Syria before the Sukhoi shoot-down. Post-shoot-down, that S-400 system is spooled up and running. “The western edge of Russ coverage for S-400,” Byron goes on, “is pretty much the same water where, say, a U.S. aircraft carrier would operate if we determined to employ such a valuable combat asset beneath the new Russ missile umbrella. Bottom line: “Military analysts are watching everything in Syria and environs,” says Byron. “What works? What doesn’t work? What equipment and systems are emerging? What equipment and systems are fading? What platforms should be replaced and upgraded? Which platforms ought to go to museums, if not to the breakers? “I’ve heard it said that in August 1914, World War I began with much the same tactical, operational and strategic levels of planning as those with which the U.S. Civil War ended in April 1865. [Ed. note: As mentioned earlier, Jim Rickards spoke up in The 5 a week ago today about “the convergence of war drums and war spending” in Washington. Turns out at that very moment, defense industry executives were gathered at a Credit Suisse conference in West Palm Beach. According to audio obtained by The Intercept, Raytheon’s CEO said he’s seeing “a significant uptick” for “defense solutions across the board in multiple countries in the Middle East.” Lockheed Martin’s executive vice president talked of “indirect benefits” from the war in Syria. As the morning wears on, the major U.S. stock indexes are drifting into the red. The S&P is now down a quarter percent at 2,058. The index is now off 1.4% for the year. Shades of 2011 — a flat year for the market, with loads of August and September volatility. Gold is selling off a bit despite some dollar weakness. At last check, the bid was $1,072. Crude is reacting little to the latest inventory report from the Energy Department — nearly flat compared with 24 hours ago at $37.47. Is Saudi Arabia aiming to take down an even bigger target than American frackers? That’s the contention of hedge fund manager Erik Townsend. We’ve explained how Jim Rickards believes Saudi Arabia is aiming for an oil price in the range of $50-60 to put most of the U.S. shale players out of business. The biggest non-OPEC producer is Russia. Depending on which day you’re looking at the figures, Russia produces even more crude than Saudi Arabia. Russian membership in OPEC, or even a treaty to engage in production quotas, would restore OPEC’s stranglehold. “Russia and Saudi Arabia jointly cutting production by only 5%,” says Erik, “would reverse the current oversupply to an undersupply. “Just one problem,” Erik goes on: “Russia has been clear: They don’t want to play ball with OPEC. Nuh-uh, no way, not interested. Erik’s forecast: Lower oil prices now, much higher prices later. “Eventually, one of two things will happen: Russia will run out of money and cave to OPEC/Saudi Arabia or Saudi Arabia will run out of money and cave to the other OPEC members who favor a production cut. “The present fire-sale buying opportunity will likely get even better from here — perhaps much better before it’s over. Then one day, there will be a massive spike up in prices, in reaction to OPEC finally cutting production, with or without co-participation from Russia. Nobody but Vladimir Putin and Ali al-Naimi will know when that day will come. “Someone Will Eventually Use CRISPR to Try to Make a Dragon or Unicorn,” says the provocative headline at Vice. Wherever we turn lately, we’re seeing news about CRISPR — the gene editing technology we first explored last week. Yesterday brought word that a British firm working with scientists from the University of Missouri have bred the first pigs resistant to a common pig virus. The condition “can be fatal, as it affects the animals’ immune system and costs farmers hundreds of millions of dollars a year,” says Reuters. Only last week, scientists gathered at a conference in Washington debated the merits of gene editing in people — a technique so powerful the altered genes can be passed on from generation to generation. They urged caution but gave a green light to editing genes in human embryos for research purposes. But for at least some scientists, editing human genes is the least of their concerns. “Why should we not expect dwarf elephants, giant guinea pigs or genetically tamed tigers?” write Stanford’s Hank Greely and the University of Wisconsin School of Medicine’s Alta Charo in The American Journal of Bioethics. Such organisms in isolation wouldn’t be a problem. But what are the chances they’d stay in isolation and not get out into the world at large? Greely and Charo fret they’d wind up altering “nature” in ways no scientist can anticipate now. As we’ve said all week, the gene editing train has left the station. Author and venture capitalist Juan Enriquez believes it has the potential to erase cancer, heart disease and Alzheimer’s. We’ve come up with a way to get his book Evolving Ourselves into your hands… and also give you ground-floor access to some of the best investing opportunities in the life sciences, starting with a mere $250 grubstake. Check out this one-of-a-kind offer right here. “At age 91, a cancer diagnosis is probably a death sentence for all us average schmucks,” a reader writes after we touched on Jimmy Carter’s successful cancer treatment. “Now, if you’re a former president of the United States, that is a different story. The 5: We understand the sentiment. But it’s misplaced in this case. The drug used to treat Mr. Carter won FDA approval in September of last year, so he’s not getting any special drug unavailable to the hoi polloi. P.S. Get ready for another accounting scandal… one so big that it could trigger the next major financial crisis in America. All 300 million American citizens are potential victims of this massive accounting hoax. Click here to find out if you’re in danger.